How? Hold Treatment head perpendicular to the skin: One way to minimize reflection losses is to make sure that the light enters perpendicular to the surface (hold the treatment head perpendicular to the surface). How? Treat on-contact: Light will be reflected at any interface it travels through. The figure to the left compares off contact and on contact treatment. With off contact treatment in the figure, there are two additional interfaces where light is reflected (treatment head-air) and (air-skin). By treating on contact, these are replaced by one interface (treatment head-skin). How? 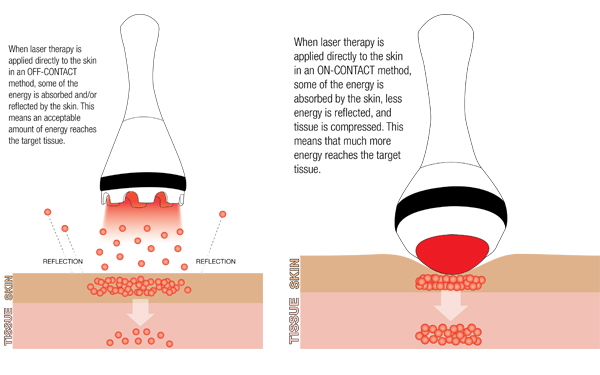 Apply Gentle Pressure: By applying a gentle pressure to the massage ball treatment head, some of the blood and water (which is found in fat) will be pushed away from directly underneath the treatment head there will be less blood and water in the path of the laser light, thus allowing more light to reach the reach the target tissue. How? Do Not Treat Through Clothing: Treatments should not be performed through clothing. Clothing will reflect and absorb some of the light, as seen in the video below. How? Choose the proper wavelength: Minimize absorption by melanin in darker skin and/or fur.